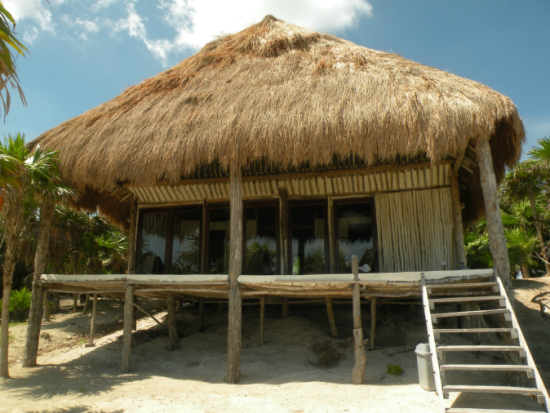 Tulum is the largest Maya construction built on the coast. Today it is Mexico’s most visited pre-Hispanic site. 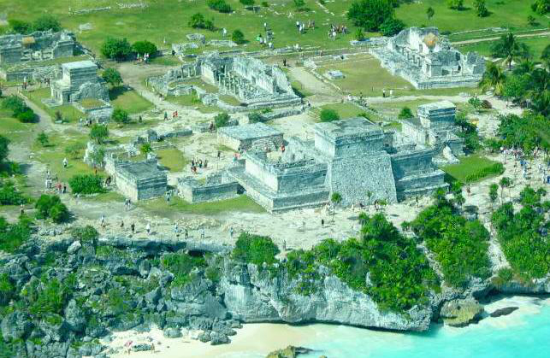 Tulum was a very important center of commerce and a place of pilgrimage in the past. This royal city, perched on limestone cliffs, is worth a visit because of the magnificent view and the charm of its buildings. Only 131 km (78 miles) south of Cancun, the walled city of Tulum was the first Mayan community reportedly sighted by the Spanish in the 16th century. 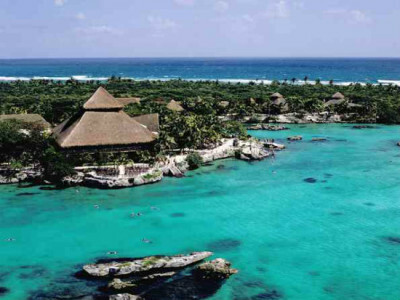 Perched atop a cliff overlooking the Caribbean, it is Quintana Roo’s most famous and well – restored site. 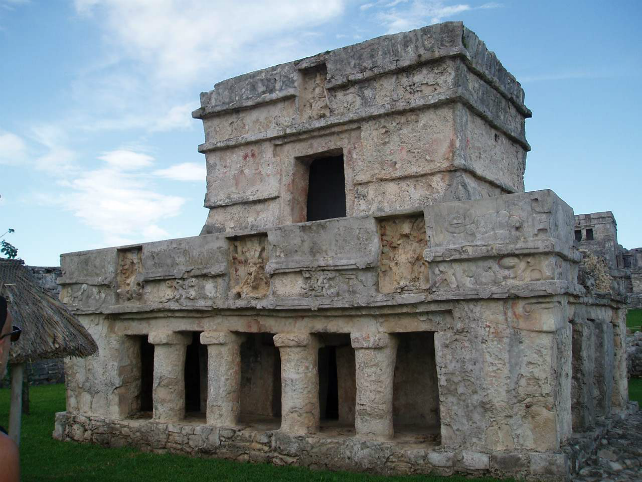 There are a number of structures in Tulum, El Castillo is the most important. Located on a 40 – foot bluff, it commands a breathtaking view of the coastline. At one time it functioned as a lighthouse guiding ships through the treacherous reefs that lie offshore. Another interesting structure at Tulum is the Temple of the Frescoes with its friezes on which the original pigment used to stain the carved figures can still be seen. Tulum is the only walled grouping of ruins discovered on the coast to date. Archaeologist believe that the city was one of the ports scattered along the coast of the Yucatan used by Mayan traders. This port city was never conquered by the Spaniards and was one of the last Maya outposts left standing during their revolt against Mexican rule in the War of the Castes during the 1840’s. 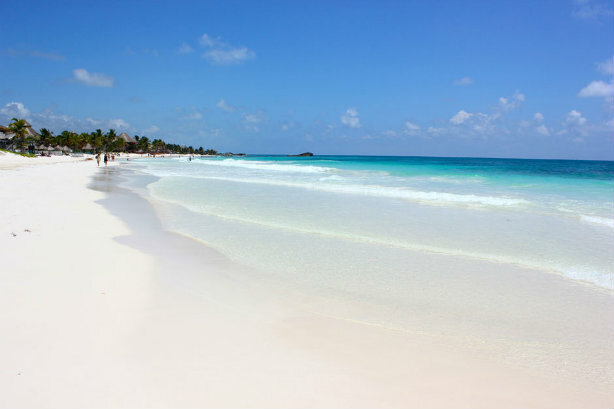 There is no question why Tulum holds great significance to the Mayans. 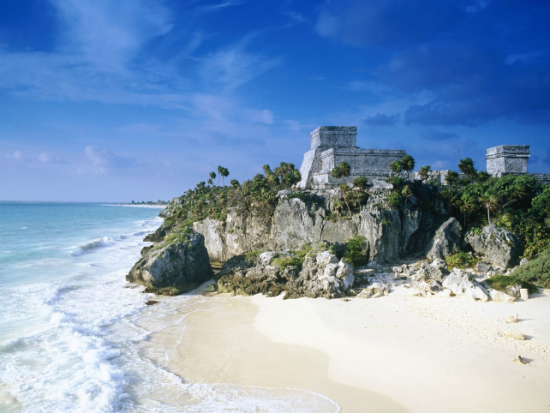 An impressive sight at Tulum is an imposing castle standing on the edge of a 12 meter cliff at the top of the ruins. Visitors may wish to bring a swim suit to cool off in a cove at the bottom of the site but there are no facilities. The area prime trekking ground for those who want to experience jungle wildlife living amidst pristine rain forest and unrestored Mayan ruins.